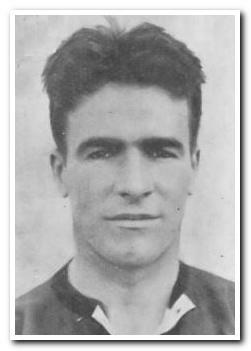 Originally from Scotland, Simpson moved to Home Park with Jimmy Rae after impressing while playing against Argyle for Scottish club Partick during a benefit match for fellow Scot and Pilgrim, Alec Hardie. Whilst Rae went on to unbridled success as a player, and later as manager, Simpson found chances far harder to come by and made just five appearances in the 1932-33 season. After leaving Home Park he returned to his homeland to play for Stranraer before crossing the Irish Sea to play for Sligo Rovers. John Simpson (my father) did not set the heather on fire at Plymouth, which disappointed him, as he had been a prolific scorer for Partick Thistle, including 9 goals in Thistle's 1931 16-0 Scottish Cup win over Royal Albert. He had previously played for Queens Park and Maryhill Juniors. I understand that he and Jimmy Rae were sold to Argyle mainly to solve financial problems at Thistle. Others may be able to confirm this, but I believe he suffered a double cartilage injury in the same knee while at Plymouth. The injury troubled him all his life, and presumably limited his playing opportunities at Home Park. After leaving Plymouth he was the player-coach at Stranraer, and finished his career at Sligo Rovers because (as he said) "You only needed one leg to play in the League of Ireland." John died in Glasgow on 13 May 1999.